If you’re looking for reliable dry lining services for your commercial or industrial property, our professional team are here for you. Dry lining is a quick and easy solution for both new-builds and refurbishment or repair projects. 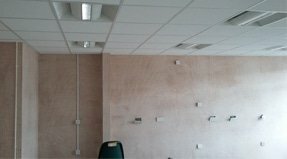 Here at Suspended Ceilings Manchester Ltd, we have been delivering interior wall treatments across the North-West for many years. Our experienced team have worked on industrial, commercial, retail and all kinds of public and private properties over the years. We are proud to offer a comprehensive interior wall coating service on any kind surface. Our team can deliver a high-quality service to ensure that your property looks incredible and remains a practical space for your business’ needs. What Is Dry Lining, and Why Do I Need It? Simple put, dry wall coating is a quick and easy way of turning any kind of surface into a practical space. Used as a plastering substitute, dry lining causes a significantly smaller disruption to the workplace and can be completed in a fraction of the time. This method is ideal for large walls and surfaces and is commonly used in all kinds of industries. Aside from a few aesthetic choices, such as feature walls in certain offices, most businesses want interior masonry and brickwork covered up. This is usually down to the aesthetic of the bricks, or because they are not a level surface for shelves and other furniture. Whatever kind of surface needs covering, dry wall coating is the perfect choice. Our team have the experience to install dry lining on a variety of surfaces, including timber and metal stud walls. An interior wall coating project involves the fitting of hard-wearing, level plasterboard to the interior wall surface. This covers the bricks or masonry completely, resulting in a professional-looking surface which is suitable for furniture and decoration. In the past, there have been issues with property insulation due to poor dry lining of interior walls. Here at Suspended Ceilings Manchester, we can solve this problem by attaching high-quality insulation to the plasterboard walls. This will not only reduce the risk of damp or mould developing, but it will work to make your business more energy efficient as well. Although we can install plasterboard directly onto the surface of your interior walls, our team can also work to create the perfect surface for your unique needs. If you’re looking to provide a comprehensive plastering alternative service to the interior walls of a warehouse, for example, we can help. One of the techniques that we use to encourage longevity in your interior walls is installing plywood. By installing a layer of plywood beneath your plasterboard, you will be able to reduce the damage that impacts can cause to the walls. Similarly, we can leave larger spaces in offices and other areas to allow for thicker insulation as required. Aesthetic Benefits – As dry lining can cover all kinds of walls, you’ll be able to create a smooth surface instead of looking at brickwork and masonry. They can also be painted and decorated as required. Energy Efficiency – As dry lining provides another layer between yourself and the outside world, particularly if it has been insulated, you’ll be able to reduce heat loss through your walls. This means that your property will cost less to heat. It will also reduce your business’ impact on the environment. Protects Your Walls – As plasterboard is easily replaceable, it can take all the damage that would otherwise have impacted your property’s walls. This can prevent your walls from sustaining damage which would lead to costly repairs. Instead, you can just replace the damaged dry lining as required. For more information on our dry lining services, don’t hesitate to get in touch with our team today. If your project will require any unique features, such as insulation or plywood protection, call us directly or email us! 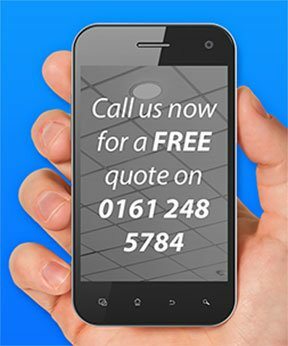 You can call us on 0161 248 5784. If you prefer, you can email any questions or concerns to info@suspendedceilingsmanchester.com and we’ll get back to you as soon as we can.